The Six Grandfathers, Paha Sapa, in the Year 502,002 C.E. Geologists believe it will take approximately 500,000 years for the portraits of the four U.S. presidents carved on Mount Rushmore to erode and become unrecognizable. "The Six Grandfathers, Paha Sapa, in the Year 502,002 C.E." asks the viewer to consider Mount Rushmore as a cultural, political, and social symbol by imagining Rushmore's inevitable disappearance and slow return to "nature." 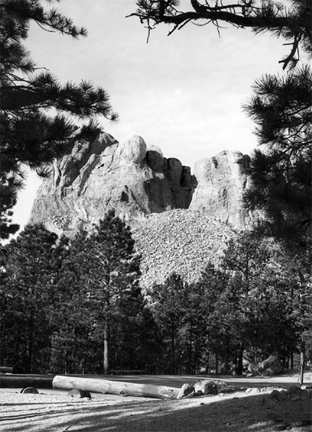 As its power to represent fades, the paradox of Rushmore's meaning as a "shrine to democracy"—on land stolen from the Sioux and carved by an artist who was an active member of the Ku Klux Klan—intensifies. A special poster edition of this work was produced for Cabinet Magazine.